Trained as a knight, yet sworn to the monastery, Reynold Welles had always lived by a strict code of honor. The night he rescues beautiful Lady Katherine Berkeley from a treasonous kidnapper, he is captivated by her innocent sensuality. Yet a secret sin already torments his soul, and his desire for Katherine only increases his anguish. Reynold is duty bound to bring the lady to the king, whose life may depend on the secret she holds. 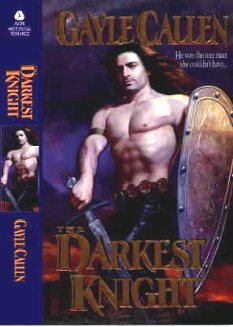 Yet when the dark knight discovers that Katherine is to be married, he is torn between doing his duty...or claiming Katherine as his own. who will fulfill your dreams of romance." He stood with his back against the crumbling brick wall, fists clenched, his cowl falling against his perspiring cheeks. Once again, he heard the sound, a woman's low moan, quickly muffled. He took a deep breath and slowly leaned towards the corner of the wall, allowing himself to peer once and then pull back. In that moment, he saw the scene quite clearly under the eerie light of a full moon. A man, not one of the brethren, gripped a struggling woman. For a moment, Brother Reynold Welles hesitated in disbelief. When he looked again, a second man had joined them, wearing the black mantle of the Benedictine brotherhood and carrying a flickering candle. This man gestured, and they moved off towards the cloister court, the heart of the monastery. What brother would need to have a woman brought to him? In the past, Reynold had known a monk or two who'd left one night, and come back with more satisfaction than they felt the peace of the Church could give them. Though Reynold well understood the lure of women, he could not so easily break his vows. But bringing an unwilling woman to St. Anthony's Priory was sheer folly--or desperation. The promises he had sworn to God and his family warred within him until his head ached. His sins still burned him, playing out over and over in endless nightmares. He should only care about his own redemption, not a stranger's. But he could picture the woman, bound and alone, forced here against her will. How would he live with himself if she died, adding another death to his conscience? Lady Katherine Berkeley yanked free her good arm and tugged at the filthy gag covering her mouth. For her trouble she received a quick blow to the head, a tap truly, but one that set her ears ringing and almost knocked the blindfold askew. A hot mouth pressed itself against her ear. "I don't want ta hurt ye, liedy. They tol' me not to, but I will if ye make me." The offending mouth remained a moment too long, and Katherine cringed with fear. He had not hurt her so far, this brutal man who'd taken her as she rode near her father's hunting lodge just two days before. But two days seemed like a lifetime of humiliation and terror. She had ridden blind-folded on a horse with more bones than flesh, perched on the thighs of a man twice her size. Gagged into silence, she had to repeatedly clutch the man's arm for a moment's privacy behind a bush. And even then, she could not know if he watched. She shivered in revulsion at the memory, as her silent captor dragged her forward. She was beyond exhaustion, beyond caring where she was. She only knew it was earth beneath her, not a galloping horse. They suddenly stopped, and her head bounced forward until her chin hit her chest. She heard a door open in front of her. A damp, sour smell assaulted her nose, and her eyes stung inside the wet blindfold. "Here," an unfamiliar voice whispered. "This place is falling into ruins. No one uses the undercroft for storage anymore. She'll keep safe enough long as she's gagged." As Katherine was prodded forward, she felt the ground squish beneath her leather slippers. A whimper escaped the gag. The room seemed to stifle all noise except the skittering of tiny feet. When she was released, Katherine panicked, not caring that this was the same man who had so brutally abducted her. She sobbed in a hoarse, muffled voice, clutching at his sleeves. "Bind her!" the new voice said. Katherine frantically shook her head, falling to her knees to silently plead with them. Everything was dark and cold and foreign, except the man who had tried not to harm her. Yet now they yanked her arms behind her back, and though she feebly struggled for a moment, her will seemed spent. It was all too much for her. She wished she didn't know their secrets. She would have been safe at home, awaiting her betrothed. She had been so naive. Would they now kill her for her knowledge? Katherine realized she was alone when the door latched shut. Lurching to her feet, she waited a moment, listening. The air was still and oppressive with silence. She shuffled forward, then stopped, hearing the echoes far above her head. Where was she? She edged sideways, trying to feel the door with her arm instead of her face. She banged her elbow and barely noticed the pain as she turned her back to run her bound hands over the door. Solid old wood, set firmly into a stone wall. She kicked once with her foot but made little sound. She did it again, harder. Did they intend to leave her here indefinitely--bound and gagged until she died? Katherine tugged hard at the ropes biting into her wrists, hating her weak arm. Sobbing, she pulled and pulled until the pain became unbearable and the blood trickled down her fingers. She staggered and fell, crying, until the world retreated for awhile and she drifted into an exhausted sleep. Katherine came awake with a jerk, then winced at the shooting pain in her shoulders. Her hands seemed numb and unresponsive. Frantically she sat up and began to wiggle her fingers, then sighed as sharp little prickles tormented her skin from inside. With her head bowed, Katherine forced herself to think through the last few weeks. She tried to tell herself she would have done something differently, but it wasn't true. Her life meant nothing when King Richard's life was at stake. She had learned of a plot against the king from a woman too terrified to publicly come forward. If Katherine did not escape soon, it would be too late. The king's enemies, whom he thought of as loyal friends, would turn on him. If only her chambermaid hadn't overheard her plans and told the kidnapper, betraying Katherine for a few coins. But she couldn't give up as they all expected her to do. For the first time in her life she faced a real challenge, with no one to help her. Whoever was behind the plot to kidnap her obviously wanted her kept alive. Why? Was it because he had something more sinister in mind for her--or maybe because he didn't want her seriously hurt. She couldn't possibly know the person--could she? Dread quivered through her stomach. She had to escape. As quickly as her bound hands allowed, Katherine explored her prison, tripping over toppled barrels and ripped sacks of grain. By the time she returned to the first and only door, she knew she was in some sort of storage room, unused and containing no windows. She had tried to cut her ropes on a broken crate, and instead set her wrists to bleeding again. When the hours began to stretch out behind her, she felt the seedlings of true panic. Had her captor been decent enough on the journey, only to allow her to die forgotten? When the door finally opened, she allowed herself a moment of relief that they remembered her. When hands touched her she began to kick wildly. She prayed that the door was still open and she could escape. Arms gripped her, lifting her easily into an unfamiliar embrace as she struggled. This was a different man than her captor, harder, taller. In sheer terror Katherine fought him, until she felt fingers at her head, loosening her blind-fold. She stilled immediately and waited to see what he had planned. A candle blinded her for a moment, then the man turned her to face him. She gasped in shock and revulsion. A monk held her in a painful grip, a monk garbed in black with a cowl hiding his face. She shrank away in terror as he lifted one hand, but he only motioned for quiet and reached for her gag. He peeled it off and her cracked lips stung unmercifully. He turned her around by the shoulders and she staggered at his strength. Katherine suffered his rough touch until her hands were free, then whirled away from him. She rubbed her raw wrists and watched him suspiciously, waiting for his next move. After all, men who chose this life usually had some dark, hidden reason. But this one merely watched her, his head cocked to one side, a black hole for a face. Why didn't he remove the hood? Katherine lifted her chin with what she hoped was a show of strength. "Are you releasing me?" As he nodded, the cowl dropped forward and swayed. She shivered with deep-rooted unease. "Then move aside and I will leave." He pointed to himself, and then the door. Katherine walked along the wall, never turning her back on the monk. "Nay, I will go alone. Is he gone yet?" As his head dropped to one side, she almost leaned over to see his face, then thought better of it. "The man who brought me here," she said. He shrugged broad shoulders in answer. "Do you not speak? Is your tongue damaged?" He shook his head, then pointed to the door with more urgency, taking a step towards her. Katherine shrank away from his menacing height and breadth, then crept around him, hoping he would leave her alone to escape. But she felt his breath on the back of her neck and shuddered as a chill swept up her spine. The open door revealed a shadowy world of sagging stone walls, and covered walkways, all lit by a cloudy moon. Across the courtyard stood an ancient church. The sound of deep voices chanting their prayers drifted on the breeze. A monastery. Who would think of looking for a noblewoman here? Katherine took a step forward and almost fell when a strong hand yanked her back behind the building. She fought the monk, terrorized by the thought of what those big hands might do to her. He merely shook her once like a child, then put a finger to his lips. He did have lips; she could see the faintest shadow of them. He pointed to himself, then her, then behind him, opposite the way she had meant to go. As Katherine began to walk, she silently debated her childhood fears. She would follow this monk as long as he proved himself trustworthy. But only until she was free of the monastery. From what Katherine could see by moonlight, everything around her was in a state of neglect. Walkways were pitted with holes where cobblestones used to be. Off to her right, dead branches hung from trees in the orchard. She was so intent on not tripping, she only vaguely noticed that the chanting had stopped. But the monk in front of her went rigid, then put out a hand behind him to stop her. When his fingers almost grazed her chest, Katherine swallowed back the sour taste of nausea. Surely it had been an accident. He hadn't even looked back at her. But her hands started shaking. She held her weak arm with the other one, a habit she wished she could conquer. With her attention diverted from the ground, she began to stumble, falling farther behind him. The dark cowl swung back towards her and she almost ran in blind fear. Katherine gasped when the monk veered towards the orchard at a sudden run. The practical side of her wanted to warn him that she didn't run well. She tended to twist ankles and bruise knees--not always her own. When he motioned towards her frantically, she took off at a fast run, hoping nothing lay in her path. Her skirts had a life of their own as they threatened to trip her or snag on overgrown plants. She pushed through the last weeds on the far side of the orchard, only to skitter to a sudden halt on the banks of a creek. She naturally lost her balance and swayed forward, flapping her arms to stay upright. The monk caught her against him, his arm beneath her breasts, his head bent well above hers. Before Katherine could collect her fragmented thoughts, he pushed her forward along the bank. She walked as fast as she could, if only to escape the warmth of his breath from behind. She tried not to think of her parched throat. The cool water continued to lure her gaze but she would not get down on her knees before him to drink. One of her slippers was captured by the mud. Katherine bent over to reach it, and the monk bumped into her backside. She almost shrieked, but instead gasped in outrage and straightened so suddenly that the top of her head slammed into his cowled face. He grunted. "Be quiet--they'll hear you!" she hissed. "I lost my slipper!" The monk raised his wool-covered head to the sky for a moment, then bent to search the mud. She grimaced when he handed the dripping shoe to her and motioned to her feet. Hopping on one foot, she put her useless slipper back on and continued alongside the creek. A wall loomed up out of the darkness. Her rescuer waded knee-deep into the water, and reached out to her. "Is there a gate on the other side?" Katherine whispered. He gestured for her hand once more. "I can cross unassisted," she said, setting one foot into the water. She slid down a moss-covered rock and landed hard against the monk's side, her face striking his shoulder. Before she arched her head away, she smelled the clean scent of the wool and for a wild moment wondered what kind of monk he was. She came to her senses and pushed at the muscled wall of his chest, his obvious strength bringing back her fright. He turned her about like a doll until her backside was pressed into his hip and his arm encircled her chest. As her breasts were flattened in his embrace, and the water tugged at her skirts, Katherine began to feel faint. Her tongue was swollen and dry, and the water dripped its sweet temptation. The monk's other arm snaked out before her, pointing downstream. She peered ahead, squinting. "Does not the water go below ground?" she whispered. She felt the slither of wool across her tangled hair as he shook his head. With his large hands at her waist he urged her forward, holding her up against the lure of slippery rocks and deep mud, until the monastery wall loomed above them in the shadows. Katherine braced both palms against the gritty stone. "I can go no farther," she said softly. "Where is the gate?" The monk dropped to his knees at her side, and pointed to where the water rushed beneath the lip of the wall. Katherine swayed with disbelief but the monk held her up. "Under there?" she squeaked, watching in a daze as the water current caught his black robe at the waist. He pulled and the flaccid muscles of her arm gave way beneath his strength until she fell to her knees on the bed of the creek. As the cold water chilled her, she gave in to temptation and scooped some into her mouth. He watched in silence, a darkly robed man in the shadowy moonlight of an ancient monastery. She ceased drinking and gaped at the black hole that was his face, repelled yet fascinated by what must lie beyond. He suddenly sank beneath the surface. Katherine stared at the circular waves made by his departure until she felt a tug on her skirts. "Oh no." She gasped a lungful of air and was pulled below.